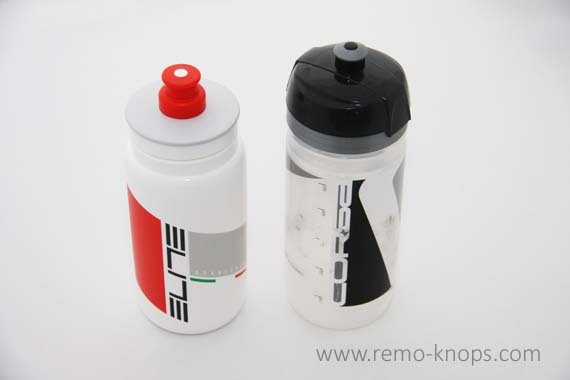 I will review the Elite Fly Team Water Bottle and ordered a set of the Fly Granfondo Elite White version. I will try to answer the question “How did Elite further innovate the water bottle ?” and compare the Elite Fly Team with for example the Elite Corsa-, Tacx Shiva- or Zefal Arctica thermo water bottle. When you pick-up an Elite Fly water bottle, there are two things that you will directly notice: (1) it is a damn light water bottle, and (2) it feels easier to squeeze. I’ve pulled out the kitchen scales to measure the weight of both the Elite Fly Team and Elite Corsa water bottle. The Elite Fly Team water bottle measures 54 gr. and the Elite Corsa water bottle tips 92 gr. on the scales. Both water bottles can contain 550 ml of sports drink, where you could potentially save 76 grams of weight by choosing the Elite Fly Team water bottles. Second weight saver is a redesigned ergonomic cap that is almost half the height of the Elite Corsa water bottle cap. Eye catching is the nozzle with a wide diameter for increased of flow sports drink. Ridges on the nozzle make it theoretically possible to have the nozzle in two positions. 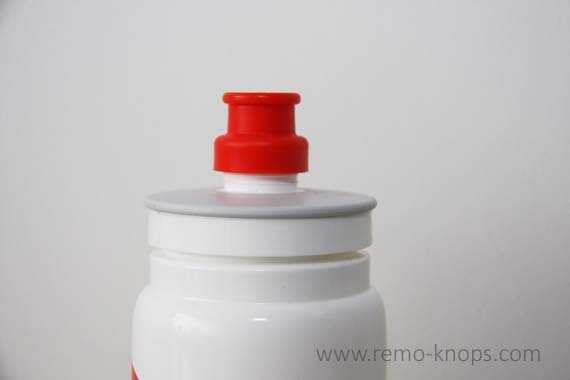 The upper part of the water bottle cap has a rubber surface, that provides grip while screwing the cap onto the Elite Fly Team water bottle. I have been using the Elite Corsa 550 ml water bottle as my preferred water bottle for some time now. 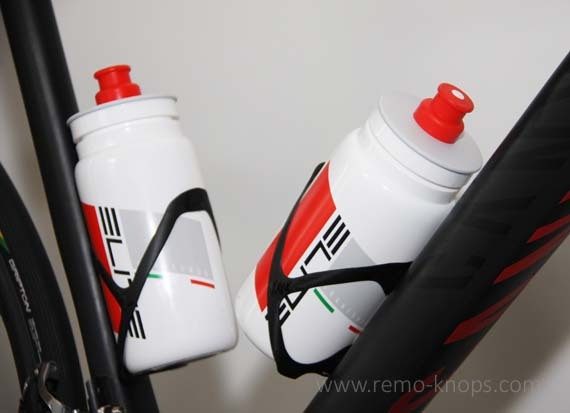 The Elite Corsa water bottles simply don’t leak sports drink on your frame and have proven to be durable. It is interesting to see that Elite has innovated the water bottle design incrementally. However don’t underestimate the amount of research and quality that has gone into the new design of the Elite Fly Team water bottle. You could potentially save 76 grams of weight by choosing the Elite Fly Team water bottles. The Elite Fly Team has a price point of EUR 5,90 which isn’t cheap (but also not extremely expensive). The Elite Corsa costs EUR 3,90 which is about 2/3 of the Elite Fly Team price. The Elite Fly Team water bottles haven’t been leaking any sports drink as I’m used from the Elite Corsa bottles. Elite Fly Team water bottles perfectly fit the Tune Wasserträger 2.0 Carbon Bottle Cages on my Canyon Ultimate CF SLX road bike. Unfortunately I can’t provide feedback yet on the durability. Personally I will keep using the Elite Corsa bottles for everyday training, while using the Elite Fly water bottles on more special events or when more climbing needs to be done.